Manage and play your LimeWire downloads with this fully integrated media center. It supports file types (MP3, OGG, WMA, WMF, WAV, MPG, MPEG, MOV, AVI, DIVX...). LimeWire Media Center supports all major file types (MP3, OGG, WMA, WMF, WAV, MPG, MPEG, MOV, AVI, DIVX, XVID, ASF, JPG, GIF, PNG, BMP, RM, DOC, TXT, ...). LimeWire Media Center is the ideal companion for the popular LimeWire P2P file sharing program. 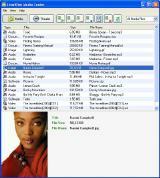 Ace CD Burner - It is a piece of software for burning MP3 or WAV files. It includes a CD ripper, an MP3 to WAV Converter, an audio CD label maker, an MP3 WAV Player. Audio CD Maker - Audio CD Maker creates normal audio CDs from your favorite MP3, WAV, WMA or OGG files. Burn your favorite songs on-the-fly to make your own customized Audio CDs. Smart MP3 CD Burner - Smart MP3 CD Burner burns custom music CDs from your MP3 or WAV (44kHz). With a built-in mini player that plays MP3. It supports ID3v1 and ID3v2 tag. Daniusoft Audio Converter Suite - Convert DVD Audio, extract the audio of video files and all popular audio formats to WMA, MP3, AC3, AAC, WAV, OGG, APE in a high quality and super fast conversion speed. 123 MP3 CD Burner - 123 MP3 CD Burner is CD-Burning software that enables you quickly and easily to create your own custom audio CDs from existing MP3 or WAV files on your system. MP3 CD Builder - Burn your favorite songs to CDs from MP3, WAV files on-the-fly so that you can listen to them in your home or car stereo CD player.